There is such a relaxed freedom in traveling alone. I am responsible for only me. Every decision to be made needs to run through whatever filters are currently open in my mind alone. 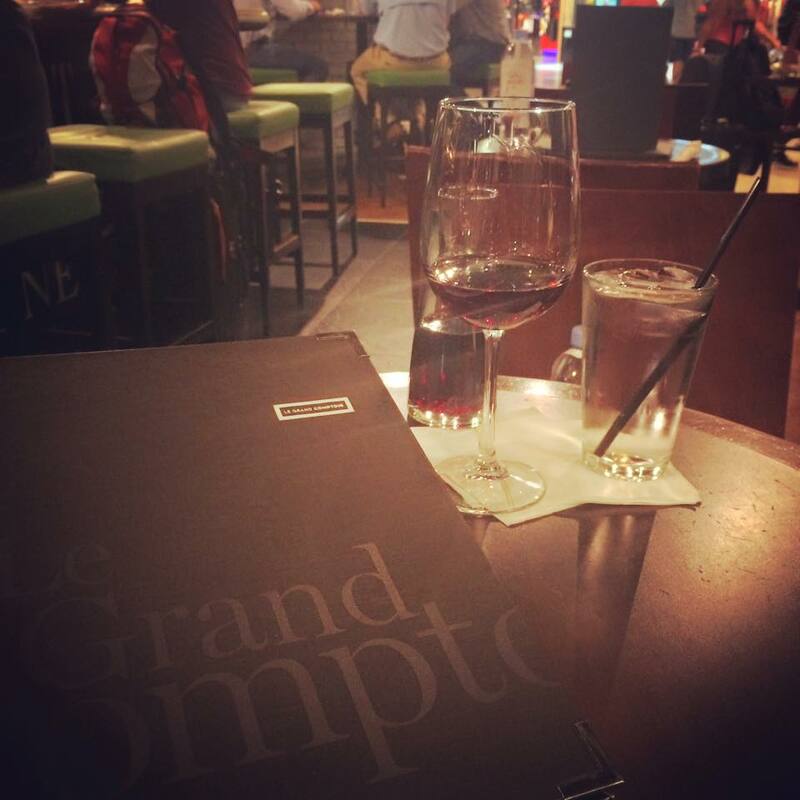 Today I choose to treat myself to a big girl, grown-up, sit-down meal at Le Grand Comptoir at the Houston airport, while I wait the two hours for my next flight. It was a harried morning. Unbelievably long security lines, a bomb sniffing dog, bad weather in Houston which caused my plane mates and I to be seated and buckled in, only to be allowed to deplane for at least an hour – or no, wait, come back in 20 minutes – get back on the plane, taxi into position, cut the engines, sit for an hour. On the tarmac. In Orlando. In August. Not an auspicious beginning to my day, or my trip to visit my brother and niece in California. But this place, this little slice of France I have chosen to dine in, softens those edges and transports me to another time. Here, as I wait for my glass of pinot noir, I am a writer in post-war Paris. Seated in a booth in a darkened corner, I can see all of life before me. Friends and lovers leaning into one another as waves of Edith Piaf float around the room mixed with the glug of wine filling glasses, the clinking of silverware on porcelain, and the murmur of voices in happy conversation. In truth, I am one of many travelers occupying just one chair at a table meant for two or more, the music is 1940’s French, mostly, and the food is delicious. But the TV over the bar, the occasional gate change announcement and the fact that all of this is being typed by thumbs into a smartphone, keep me pretty rooted in the present. I have enjoyed my sojourn here in Paris, but must now pay up and find my gate in Houston. I leave with a promise to write every day. A promise that holds no weight as it sits always in the front of my brain. I want to write in real time, I say, what is happening right now, or at least today. I want to share fresh thoughts as opposed to reimagined memories. But it’s really impossible no matter how I slice it. Once it has happened it is already past, so I reconcile myself to writing daily with fresh eyes, a fresh perspective and perhaps that is even better. And hopefully this time I mean it. On to California. Au revoir.